Worldwide-USA.com (Worldwide Products Inc.) announces the industry's best design site. - Greater than 5000+ products to choose from - compare to 5-20 products at most other sites. - Greatest selection & flexibilty of clip art, image and text fonts. Currently we have 150,000+ clip art images. If they do have multi color clipart most do not let you change the colors they have. - Best product pricing - we do not charge a premium for creating your design here. While some sites entice you with quote "Free Shipping" they build it into their higher product prices. embroidery "Instant Stitch Estimator"™ - saves you & us days of communications. Worldwide-USA.com (Worldwide Products Inc.) announces an industry exclusive. Instant Stitch Estimator™ saves you & us days of communications. Even if you have your logo already digitized and you know the # of stitches - you may want to resize the design therefore altering your # of stitches & cost. This industry exclusive (US Patent #9,518,347 Dec 13 2016) eliminates the need to pass art files back & forth while specialist quote you the number of stitches & therefore the cost of your embroidery. a member of a Barter Exchange. To go to our Barter site: Worldwide-Barter.com. Semi-flexible Polyethylene, Made in the USA. Size: W 1 1/2" x H 3"
--If the first quantity column is 1 - that may be for samples. - Minimum Quantity is determined by each of the 1000+ manufactures we deal with. - They set the number in the 1st column. - They often (but not always) will sell blanks at less than their minimum, especially apparel. - Many times an individual manufacturer will allow you to buy less than the 1st column quantity but will charge a "Less Than Minimum" charge in the range of $20-$80. When they do this they will refer to an "Absolute Minimum Quantity" (this is usually about 50% of their 1st column quantity. We will be glad to call an individual manufacturer if needed. In our Apparel Product Pages - our Color/Size Grid - has Dynamic Pricing that changes with the total quantity to match the grey Quantity/Price Grids at the bottom of the Color/Size Grid as your quantity selected increases a yellow background shows your current price break - and in the Color/Size Grid the individual costs change as quantities increase. Also mouse over the color squares for larger swatches and or images. *Pricing and availability subject to change without notice. Spring Clip Key Chain With a push of a button the plastic key chain will spring open. Size: 3 1/8" w x 1" h Imprint Area: 1 3/8" w x 11/16" h Carton Size: 16" height x 11" width x 17" length Carton Weight: 31 lbs / 1200 pcs. Minimum Quantity 20 pieces per attachment within your order of catalog minimum quantity by process. Mix and match within an order as long as it meets the catalog minimum. Add the attachment cost to the cost of your emblem. 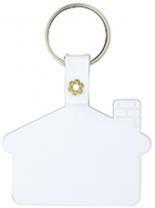 Continental Key Tag has all-around appeal and choice of colors. Size : 1-1/2"W X 3"H X 1/4"D. Imprint Area: Front, 1"w x 1-1/8"h, 1 color(s) max. Back (Optional, additional charge): 1"w x 1-1/8"h, 1 color(s) max. Packaging: Bulk Pack Of: 1250 Weight: 25 lbs. Most popular keytag, Made in the USA, Made of polyethylene. Size : W 1 5/8" x H 2 3/8"
Rectangular soft key tag is thick and pliable. Includes metal split key ring. Decorating Dimensions: 1-3/16"H x 1-7/16"W per side Shipping Information Packed: 500 Per Box Actual Weight: 14 lbs. 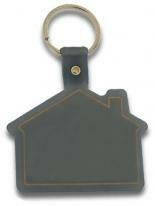 Number One shaped key tag, Variety of colors available. Size: 1-9/16" W x 2-9/16" H Imprint Area: 7/8" W x 2-3/8" H Packaging: Bulk packed. Weight: Approx. 19 lbs./M. Octagon shaped key tag. Size: 1-3/4" W x 1-3/4" H Imprint Area: 1-3/8" diameter Packaging: Bulk packed. Weight: Approx. 14 lbs./M. 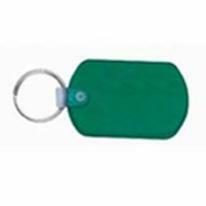 Saddle shaped key tag Variety of colors available. Size: 1-1/2" W x 2" H Imprint Area: 1" W x 1-7/16" H Packaging: Bulk packed. Weight: Approx. 16 lbs./M. Made of semi-flexible polyethylene, Made in the USA. 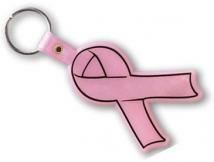 Size : W 2 3/8" x H 2 1/8"
A plastic pull apart key chain with detachable ends. Size: 3 1/14"w x 1"h Imprint Area: 1" w x 1/2" h Carton Size: 17" height x 11" width x 9" length Carton Weight: 22 lbs / 1000 pcs. To suit business and promotional themes. Includes 1" split-ring or specify 1 1/2" split-ring for an additional charge. Large 1 1/2" split-ring, add $.05 each. Wrist Coil includes small split-ring. Dimensions: 2 7/8" H x 1 1/2" W Imprint Area: 1 3/8" H x 1" W Packaging: Individually poly-bagged Shipping Info: Box Dimensions: 16" L x 12" W x 12" H Shipping Weight: 1.99 lbs / 100 pcs 1500 pcs / box. 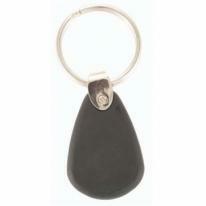 A key chain in the shape of an oval made from soft flexible PVC plastic. Size: 2 1/2"w x 1 3/8"h Imprint Area: 1 1/2"w x 3/4"h Carton Size: 17" height x 13" width x 5" length Carton Weight: 22 lbs/1000 pcs. 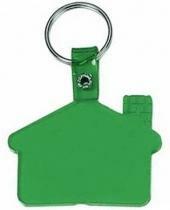 A key chain in the shape of a house made from soft flexible PVC plastic. Size: 2 1/2" w x 1 3/8" h Imprint Area: 1 1/2" w x 3/4" h Carton Size: 17" height x 13" width x 5" length Carton Weight: 20 lbs pcs/1000 pcs. 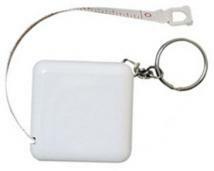 A key chain in the shape of a rectangle made from soft flexible PVC plastic. Size: 2 1/2"w x 1 1/2"h Imprint Area: 2"w x 1 1/4"h Carton Size: 17" height x 13" width x 6" length Carton Weight: 29 lbs/1000 pcs. To suit business and promotional themes. Includes 1" split-ring or specify 1 1/2" split-ring for an additional charge. Options: For glow-in-the-dark key-tags, add $.04 each. Large 1 1/2" split-ring, add $.05 each. Wrist Coil includes small split-ring. Dimensions: 1 5/8" H x 3 1/16" W Imprint Area: 1" H x 1 5/8" W Packaging: Individually poly-bagged Shipping Info: Box Dimensions: 16" L x 12" W x 12" H Shipping Weight: 2.19 lbs / 100 pcs 1500 pcs / box. Made of soft, flexible vinyl. Size : W 2 1/4" x H 1 3/8"
Made of soft, flexible vinyl. Size : W 2" x H 1 1/2"
Made of flexible plastic,Copy is protected by Tag-Master's new screen process to last,Assembled with rugged silver rings and attached with sturdy strap. Size : W 2 1/4" x H 1 1/2"
Attachments: All tags are supplied with bead chains in choice of Silver or Gold. Thin rings and heavy rings may be substituted at no extra charge. Tags, printed cards and attachments are shipped unassembled. Assembly of chains add .10Â¢ (G) ea. Assembly of rings not available Size : W: 2" x H: 1-3/8"
To suit business and promotional themes. Includes 1" split-ring or specify 1 1/2" split-ring for an additional charge. For glow-in-the-dark key-tags, add $.04 each. Large 1 1/2" split-ring, add $.05 each. Wrist Coil includes small split-ring. Dimensions: 1 1/4" H x 3 7/8" W Imprint Area: 5/8" H x 1 5/8" W Packaging: Individually poly-bagged Shipping Info: Box Dimensions: 16" L x 12" W x 12" H Shipping Weight: 2.40 lbs / 100 pcs 1500 pcs / box. To suit business and promotional themes. Includes 1" split-ring or specify 1 1/2" split-ring for an additional charge. Options: For glow-in-the-dark key-tags, add $.04 each. Large 1 1/2" split-ring, add $.05 each. Wrist Coil includes small split-ring. Dimensions: 3" H x 2 1/4" W Imprint Area: 1/2" H x 1 1/8" W Packaging: Individually poly-bagged Shipping Info: Box Dimensions: 16" L x 12" W x 12" H Shipping Weight: 2.37 lbs / 100 pcs 1500 pcs / box. To suit business and promotional themes. Includes 1" split-ring or specify 1 1/2" split-ring for an additional charge. Options: For glow-in-the-dark key-tags, add $.04each. Large 1 1/2" split-ring, add $.05 each. Wrist Coil includes small split-ring. Dimensions: 1 1/4" H x 4" W Imprint Area: 5/8" H x 2 1/16" W Packaging: Individually poly-bagged Shipping Info: Box Dimensions: 16" L x 12" W x 12" H Shipping Weight: 2.50 lbs / 100 pcs 1500 pcs / box. To suit business and promotional themes. Includes 1" split-ring or specify 1 1/2" split-ring for an additional charge. For glow-in-the-dark key-tags, add $.04 each. Large 1 1/2" split-ring, add $.05 each. Wrist Coil includes small split-ring. Dimensions: 1 1/2" H x 3 5/8" W Imprint Area: 9/16" H x 1 1/2" W Packaging: Individually poly-bagged Shipping Info: Box Dimensions: 16" L x 12" W x 12" H Shipping Weight: 2.18 lbs / 100 pcs 1500 pcs / box. To suit business and promotional themes. Includes 1" split-ring or specify 1 1/2" split-ring for an additional charge. Options: For glow-in-the-dark key-tags, add $.04 each. Large 1 1/2" split-ring, add $.05 each. Wrist Coil includes small split-ring. Dimensions: 2 1/2"H x 1 3/4"W Imprint Area: 1 1/2" H x 1 1/2" W square Packaging: Individually poly-bagged Shipping Info: Box Dimensions: 16" L x 12" W x 12" H Shipping Weight: 2.32 lbs / 100 pcs. 1500 pcs / box. To suit business and promotional themes. Includes 1" split-ring or specify 1 1/2" split-ring for an additional charge. Large 1 1/2" split-ring, add $.05 each. Wrist Coil includes small split-ring. Dimensions: 3 1/8"H x 2 11/16"W Imprint Area: 1 15/16"H x 2 1/8"W Packaging: Individually poly-bagged Shipping Info: Box Dimensions: 16" L x 12" W x 12" H Shipping Weight: 2.51 lbs / 100 pcs. 1500 pcs / box. To suit business and promotional themes. Includes 1" split-ring or specify 1 1/2" split-ring for an additional charge. Options: For glow-in-the-dark key-tags, add $.04 each. Large 1 1/2" split-ring, add $.05 each. Wrist Coil includes small split-ring. Dimensions: 3 5/8" H x 1 7/8" W Imprint Area: 1 3/8" H x 7/8" W Packaging: Individually poly-bagged Shipping Info: Box Dimensions: 16" L x 12" W x 12" H Shipping Weight: 2.29 lbs / 100 pcs 1500 pcs / box. To suit business and promotional themes. Includes 1" split-ring or specify 1 1/2" split-ring for an additional charge. 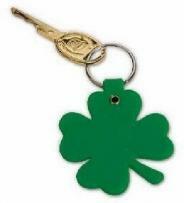 For glow-in-the-dark key-tags, add $.04 each. Large 1 1/2" split-ring, add $.05 each. Wrist Coil includes small split-ring. Dimensions: 2 3/8" H x 1 3/4" W Imprint Area: 1 1/2" diameter Packaging: Individually poly-bagged. Shipping Info: Box Dimensions: 16" L x 12" W x 12" H Shipping Weight: 1.99 lbs / 100 pcs 1500 pcs / box. To suit business and promotional themes. Includes 1" split-ring or specify 1 1/2" split-ring for an additional charge. Options: For glow-in-the-dark key-tags, add $.04 each. Large 1 1/2" split-ring, add $.05 each. Wrist Coil includes small split-ring. Dimensions: 2 1/2" H x 2 1/8" W Imprint Area: 5/8" H x 1" W Packaging: Individually poly-bagged Shipping Info: Box Dimensions: 16" L x 12" W x 12" H Shipping Weight: 2.59 lbs / 100 pcs 1500 pcs / box. To suit business and promotional themes. Includes 1" split-ring or specify 1 1/2" split-ring for an additional charge. Options: For glow-in-the-dark key-tags, add $.04 each. Large 1 1/2" split-ring, add $.05 each. Wrist Coil includes small split-ring. Dimensions: 2 5/8"H x 2 1/4"W Imprint Area: 7/8" H x 1" W Packaging: Individually poly-bagged Shipping Info: Box Dimensions: 16" L x 12" W x 12" H Shipping Weight: 2.44 lbs / 100 pcs. 1500 pcs / box. To suit business and promotional themes. Includes 1" split-ring or specify 1 1/2" split-ring for an additional charge. Options: For glow-in-the-dark key-tags, add $.04 each. Large 1 1/2" split-ring, add $.05 each. Wrist Coil includes small split-ring. Dimensions: 1 1/4" H x 3 1/2" W Imprint Area: 1" H x 1" W square, 5/16" H x 1 3/8" W shaft. Packaging: Individually poly-bagged Shipping Info: Box Dimensions: 16" L x 12" W x 12" H Shipping Weight: 1.97 lbs / 100 pcs. 1500 pcs / box. To suit business and promotional themes. Includes 1" split-ring or specify 1 1/2" split-ring for an additional charge. Options: For glow-in-the-dark key-tags, add $.04 each. Large 1 1/2" split-ring, add $.05 each. Wrist Coil includes small split-ring. Dimensions: 3 7/8" H x 2" W Imprint Area: 1 1/4" H x 2" W Packaging: Individually poly-bagged Shipping Info: Box Dimensions: 16" L x 12" W x 12" H Shipping Weight: 2.76" lbs / 100 pcs 1500 pcs / box. To suit business and promotional themes. Includes 1" split-ring or specify 1 1/2" split-ring for an additional charge. Options: For glow-in-the-dark key-tags, add $.04 each. Large 1 1/2" split-ring, add $.05 each. Wrist Coil includes small split-ring. Dimensions: 3 5/8" H x 2 1/8" W Imprint Area: 2 1/2" H x 1 3/4" W Packaging: Individually poly-bagged Shipping Info: Box Dimensions: 12" L x 12" W x 10" H Shipping Weight: 4.15 lbs / 100 pcs 500 pcs / box. To suit business and promotional themes. Includes 1" split-ring or specify 1 1/2" split-ring for an additional charge. Options: For glow-in-the-dark key-tags, add $.04 each. Large 1 1/2" split-ring, add $.05 each. Wrist Coil includes small split-ring. Dimensions: 3 1/4" H x 1 1/2" W Imprint Area: 1 7/16" H x 7/8" W top 9/16" H x 1 5/16" W bottom Packaging: Individually poly-bagged Shipping Info: Box Dimensions: 16" L x 12" W x 12" H Shipping Weight: 2.41 lbs / 100 pcs 1500 pcs / box. To suit business and promotional themes. Includes 1" split-ring or specify 1 1/2" split-ring for an additional charge. Options: For glow-in-the-dark key-tags, add $.04 each. Large 1 1/2" split-ring, add $.05 each. Wrist Coil includes small split-ring. Dimensions: 1 3/4" H x 3 1/8" W Imprint Area: 1" H x 1 5/8" W Packaging: Individually poly-bagged Shipping Info: Box Dimensions: 16" L x 12" W x 12" H Shipping Weight: 2.58 lbs / 100 pcs 1500 pcs / box. To suit business and promotional themes. Includes 1" split-ring or specify 1 1/2" split-ring for an additional charge. Options: For glow-in-the-dark key-tags, add $.04 each. Large 1 1/2" split-ring, add $.05 each. Wrist Coil includes small split-ring. Dimensions: 1 7/8" H x 2 1/4" W Imprint Area: Pad: 1/2" H x 1" W Toes: 7/16" diameter Packaging: Individually poly-bagged Shipping Info: Box Dimensions: 16" L x 12" W x 12" H Shipping Weight: 2.27 lbs / 100 pcs 1500 pcs / box. To suit business and promotional themes. Includes 1" split-ring or specify 1 1/2" split-ring for an additional charge. Options: For glow-in-the-dark key-tags, add $.04 each. Large 1 1/2" split-ring, add $.05 each. Wrist Coil includes small split-ring. Dimensions: 2 5/8"H x 2 1/8"W Imprint Area: 3/4" H x 1" W top; 1/4" H x 1 3/8" W bottom Packaging: Individually poly-bagged Shipping Info: Box Dimensions: 16" L x 12" W x 12" H Shipping Weight: 2.53 lbs / 100 pcs. 1500 pcs / box. To suit business and promotional themes. Includes 1" split-ring or specify 1 1/2" split-ring for an additional charge. Options: For glow-in-the-dark key-tags, add $.04 each. Large 1 1/2" split-ring, add $.05 each. Wrist Coil includes small split-ring. Dimensions: 1 1/4"H x 3 5/8"W Imprint Area: 1 1/8" H x 2 5/8" W Packaging: Individually poly-bagged Shipping Info: Box Dimensions: 12" L x 12" W x 12" H Shipping Weight: 2.83 lbs / 100 pcs. 1000 pcs / box. To suit business and promotional themes. Includes 1" split-ring or specify 1 1/2" split-ring for an additional charge. Options: For glow-in-the-dark key-tags, add $.04 each. Large 1 1/2" split-ring, add $.05 each. Wrist Coil includes small split-ring. Dimensions: 1 7/16" H x 2" W Imprint Area: 1 1/4" H x 1 7/8" W Packaging: Individually poly-bagged Shipping Info: Box Dimensions: 16" L x 12" W x 12" H Shipping Weight: 1.63 lbs / 100 pcs. 2000 pcs / box. To suit business and promotional themes. Includes 1" split-ring or specify 1 1/2" split-ring for an additional charge. Options: For glow-in-the-dark key-tags, add $.04 each. Large 1 1/2" split-ring, add $.05 each. Wrist Coil includes small split-ring. Dimensions: 1 1/2"H x 3 3/8"W Imprint Area: 1 1/4" H x 2" W Packaging: Individually poly-bagged Shipping Info: Box Dimensions: 16" L x 12" W x 12"H Shipping Weight: 2.48 lbs / 100 pcs. 1500 pcs / box. To suit business and promotional themes. Includes 1" split-ring or specify 1 1/2" split-ring for an additional charge. Options: For glow-in-the-dark key-tags, add $.04 each. Large 1 1/2" split-ring, add $.05 each. Wrist Coil includes small split-ring. Dimensions: 2 1/2" H x 1 7/8" W Imprint Area: 1" H x 1" W square Packaging: Individually poly-bagged Shipping Info: Box Dimensions: 16" L x 12" W x 12" H Shipping Weight: 2.00 lbs / 100 pcs. 1500 pcs / box. To suit business and promotional themes. Includes 1" split-ring or specify 1 1/2" split-ring for an additional charge. Dimensions: 3 1/2" H x 1 1/2" W Imprint Area: 5/16" H x 1 3/4" W Packaging: Individually poly-bagged Shipping Info: Box Dimensions: 16" L x 12" W x 12" H Shipping Weight: 2.33 lbs / 100 pcs 1500 pcs / box. To suit business and promotional themes. Includes 1" split-ring or specify 1 1/2" split-ring for an additional charge. Options: For glow-in-the-dark key-tags, add $.04 each. Large 1 1/2" split-ring, add $.05 each. Wrist Coil includes small split-ring. Dimensions: 2 11/16" H x 2 1/4" diameter Imprint Area: 2 1/4" diameter Packaging: Individually poly-bagged Shipping Info: Box Dimensions: 12" L x 12" W x 10" H Shipping Weight: 3.08 lbs / 100 pcs 500 pcs / box. To suit business and promotional themes. Includes 1" split-ring or specify 1 1/2" split-ring for an additional charge. Options: For glow-in-the-dark key-tags, add $.04 each. Large 1 1/2" split-ring, add $.05 each. Wrist Coil includes small split-ring. Dimensions: 1 1/2" H x 3" W Imprint Area: 5/8" H x 1 1/8" W Packaging: Individually poly-bagged Shipping Info: Box Dimensions: 16" L x 12" W x 12" H Shipping Weight: 1.99 lbs / 100 pcs 1500 pcs / box. To suit business and promotional themes. Includes 1" split-ring or specify 1 1/2" split-ring for an additional charge. Options: For glow-in-the-dark key-tags, add $.04 each. Large 1 1/2" split-ring, add $.05 each. Wrist Coil includes small split-ring. Dimensions: 1 9/16" H x 3 1/4" W Imprint Area: 1" H x 1" W Packaging: Individually poly-bagged. Standard shaped fob Large variety of colors available. Size: 2-3/16" W x 1-7/16" H Imprint Area: 1-5/8" W x 1-3/16" H Packaging: Bulk packed. Weight: Approx. 32 lbs./M. Patented, can-shaped design features durable, lever edge to easily open pop-top cans and sturdy, grooved teeth provide no-slip opening of metal twist-off caps. Options: Wrist coils include small split-ring. Large 1 1/2"split-ring, add $.05 each. Dimensions: 2 5/8" H x 1 1/8" W x 1/2" D Imprint Area: Front: 1"H x 1 11/16"W Back: 5/16"H x 1/2"W. Packaging: Bulk. For individual poly-bagging, add $.08 each. Shipping Info: Box Dimensions: 16" L x 12" W x 12" H Shipping Weight: 1.78 lbs / 100 pcs. 1500 pcs / box. Patented, bottle-shaped design features durable, lever edge to easily open pop-top cans and sturdy, grooved teeth provide no-slip opening of metal twist-off caps. Options: Wrist coils include small split-ring. Large 1 1/2"split-ring, add $.05 each. Dimensions: 3 1/16" H x 1" W x 1/2" D Imprint Area: Front: 1 1/2"H x 3/4"W Back: 5/16"H x 9/16"W Packaging: Bulk. For individual poly-bagging, add $.08 each. Shipping Info: Box Dimensions: 16" L x 12" W x 12" H Shipping Weight: 1.92 lbs / 100 pcs. 1500 pcs / box. 39" Metal Tape With Metric/Inch Scale Snake Chain Key Ring Attachment. Approximate Size: 1 1/2" W x 1 1/2" H Imprint Area: 1" W x 1" H Packaging: Cello Bag, 500 per carton @ 25 lbs. 40" Cloth Tape with Metric/Inch Scale Push Button Retractable, Auto Lock Key Ring Attachment. Approximate Size: 1 3/4" W x 1 3/4" H Imprint Area: 1" W x 1" H Packaging: Cello Bag, 500 per carton @ 21 lbs. Press Built-In Back Button to Activate Red Light Batteries Included. Approximate Size: 1 1/4" W x 1 3/4" H Imprint Area: 3/4" W x3/4" H Packaging: Cello Bag, 500 per carton @ 29 lbs. 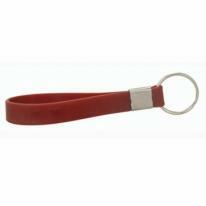 Our new multi-function beverage opener key ring has an even larger imprint area. It is designed to open bottles and pop-top cans. Product SIze: 2-3/4" x 13/16" Imprint Area: 1/2"H x 1 1/4"H to 1 3/4"W Irregular Packaging: Individual Polybag No Extra Charge Packaging Dimensions: 17"(L) X 8"(W) X 5"(H) Units Per Box: 500 Shipping Weight: 15 lbs.